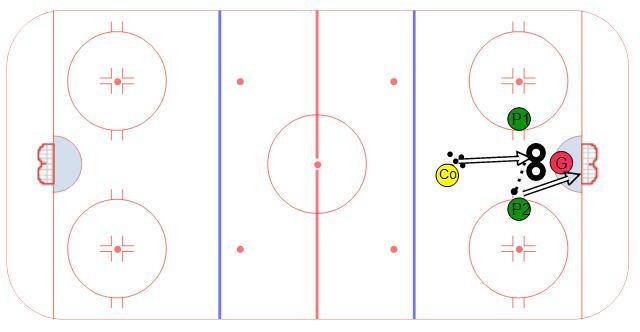 Here is a drill for goalies that focuses on reaction time and positioning. A coach sets up with a pile of pucks in the slot area. Two tires are placed directly in front of the goalie. Two players are off to the side of the tires to bang home the rebounds as they bounce out of the tires. The shooter also has the option to shoot over the tires so the goalies hav eto be ready for that as well. Goalies need to react as fast as possible to the rebound and square up to the shooter. For younger or more inexperienced goalies you can make the rebounders do one stickhandle before shooting. This will give the goalies a chance to square up to the rebound before the shot.